Summer is the season of all things bright, light and fun. It’s also the season when you need to protect yourself the most from the harsh rays of the sun. Here are a few essentials you should have to make sure you stay protected while staying on trend. 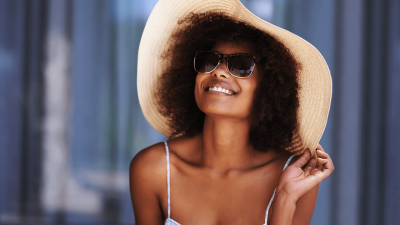 Sunglasses are undoubtedly the most stylish way to protect your eyes - you can’t get through summer without them! With so many affordable options to choose from, you can get yourself ones in various shapes and colours. The trendiest style for sunglasses right now are cat eye sunglasses, which range from modern to retro. Wide brim hats never go out of style! They’ve been stylish since they were invented and women today still enjoy wearing them for different occasions. But their best use it to protect your face from the sun. So if you wear this you know that you’ll be stylish while keeping your skin safe. You can get a few of these hats at Mr Price from R100.00. Sunscreen is an absolute essential, no matter what your skin colour. Sunscreen can be a bit on the pricey side so shop around for the best discounts. You can find a few under R100 at Clicks Pharmacy or, if you don’t want to invest in too much at one time, you can find sachets for under R20 at Dis-Chem. Sunscreen doesn’t just protect your skin from burning but also from ageing prematurely - so it’s highly recommended. Water is essential every day, but even more so in Summer - when you’re more likely to get dehydrated from the heat. It can seem like an inconvenience to carry a water bottle around but you’ll thank yourself when you’re out and suddenly get thirsty. Carrying your own bottle around also saves you from having to buy water at a store (or from quenching your thirst with a sugary drink). If you’re fashion conscious and prefer everything you walk out the door with to be fashion-forward, then consider getting yourself a cute water bottle with a statement or style that represents you. A beach bag is the essential you need to keep all your other essentials together. Not only are they really popular right now Choma, they’re really convenient. They’re big enough to pack just about everything you need, versatile enough for different occasions - from the beach to a day out with the girls, and they’re stylish enough to go with just about any outfit. If you’re into summer -saving, you can get cute and affordable ones at Mr Price. What do you think about these essentials Choma; do you have some or all of them? What’s on your list of essentials? Let me know in the comments below.